Weight loss is a topic that never gets old. Losing weight faster and easier is a desire of many, but the challenge remains how to lose the weight and keep it off. Ever so often we read about the next diet trend and new ways to make it easier to stay lean and look good. Our self-image is influenced heavily by what we perceive as ‘healthy’ on magazine covers, social media and television. But what does good health really entail? Is it really limited to the number we see on the scale? WHY IS IT NOT ADVISABLE TO FOLLOW A GENERIC (‘MAGAZINE’) DIET? Diet/ meal plans in magazines or on the internet have not considered your individual body type, medical history or family history before setting up a plan. The plans aren’t based on your individual goals or needs. They don’t consider your unique schedule, food intolerance’s /allergies and likes or dislikes. The more a plan is structured around what you need as an individual, the better you’ll be able to follow it. WHAT ARE MACRO-NUTRIENTS AND WHAT DO I NEED TO FUEL MY BODY? Our body’s ‘fueling’ system works in a similar way to how your car works. Your car’s fuel needs to be replaced quite often, but it needs oil and water to function properly as well. If one of the components is depleted, adding to one of the others won’t restore that component. Also adding too much of any one of the components won’t make it run better. With a car there is no extra storage facility for adding too much petrol, oil or water. Our bodies, however, do have this system. This system stores excess energy and can make us gain weight unintentionally. Macro-nutrients include carbohydrates, proteins and fats. They are the three components that give our bodies energy, build up our muscles and sustain life. All types of food will be grouped in one or more of these groups. If we could choose one macro-nutrient that has been ‘picked on’ most in recent years it would be carbohydrates. This group is widely blamed for weight gain or for struggling to lose weight. Various diet plans simply advise you to cut carbohydrates out of your diet and ‘voila’ you have the perfect body. But is it really so simple? Carbohydrates are also called “complex sugars”. As shown in the picture, this basically means that a lot of sugar molecules are all attached to each other and should be broken down in the body before sugar is absorbed in the blood stream. The only way to use carbohydrates would be for your body to break it down to glucose (the more scientific name for sugar). In your blood stream it is referred to as blood sugar. 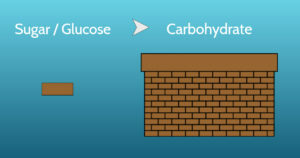 All carbohydrate containing foods are classified either as low, medium or high glycaemic index (GI). Glycaemic index refers to the digestion and absorption of sugar (glucose) from the small intestines to the blood stream. Carbohydrate containing foods include starches, fruit, dairy, vegetables and normal sugar. Normal added sugar is the least valuable to your health as it contains no fibre, vitamins or minerals and just provides calories. Starches are classified as either refined or unrefined. We ideally want to include the unrefined alternatives as these ensure slower digestion and absorption of glucose (sugar) in the blood stream. This process keeps blood glucose control intact and prevents fluctuations in glucose levels. This control in turn prevents insulin spikes which can lead to insulin resistance and eventually diabetes. Sources of these include high fibre breads and crackers, sweet potatoes, brown rice and whole wheat pastas. These are generally referred to as low GI starches. Refined carbohydrates include white bread, white pasta, pastries, biscuits, potato crisps and crackers that are lower in fibre. These cause a rapid rise in your blood sugar levels as the body doesn’t have much difficulty digesting it and breaking it down. The higher availability and presence of insulin means that the insulin will rapidly pack the glucose away in the cells. Any glucose that isn’t used will be converted to fat and this will lead to weight gain. It happens easily with high GI foods. The majority of dairy products fall under the low GI group as they contain protein which slows down glucose absorption. Fruit are also classified in the low, medium and high GI groups. 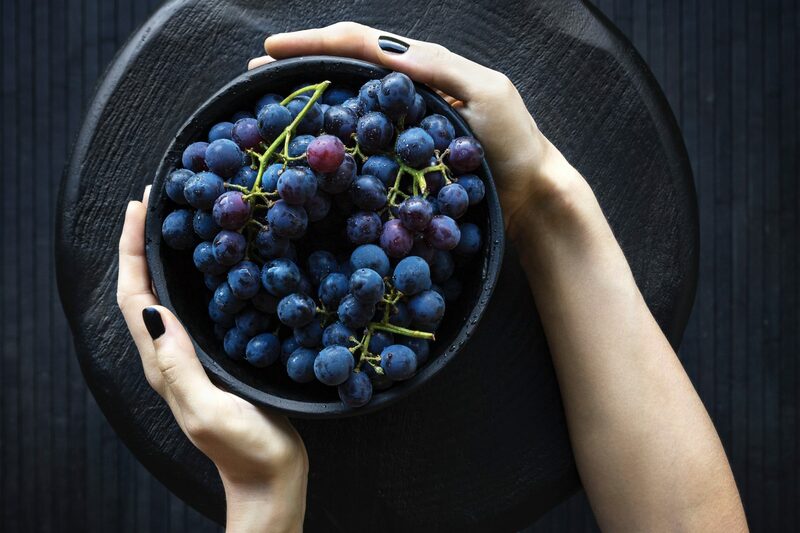 Generally speaking, all berries, citrus fruit, apples, pears and grapes (in controlled portions) are included in the low GI group. These fruit contain a higher amount of fructose (fruit sugar) and a lower amount of actual glucose. Fructose needs to be taken to the liver before it can be processed and used. This means that a smaller quantity of glucose is absorbed and influences the blood glucose levels. Medium GI fruit include bananas, pineapples and paw-paw. They have a higher glucose content and therefor influence the blood glucose levels faster. Fresh fruit in the high GI group include only watermelon. It has the highest glucose and lowest fructose content. Protein rich foods are needed to maintain our body’s muscle content, but they do so much more than that. Just as the building blocks of carbohydrates are glucose molecules, the building blocks for proteins are amino acids . There are 3 groups of amino acids, namely essential, non-essential and conditionally essential amino acids. There are 21 amino acids that can form proteins in our bodies and they all fall in these 3 groups. Essential amino acids cannot be formed by our bodies and we need to consume them through our diets. They include Histidine, Isoleucine, Leucine, Lysine, Methionine, Phenylalanine, Threonine, Tryptophan and Valine. Foods that contain all 9 essential amino acids are called high quality protein. High quality protein can be found in animal foods and certain plant foods. These amino acids can be formed by your body and you don’t need to get them from your diet. They include Alanine, Asparagine, Aspartic acid, Glutamic acid and Selenocysteine. These amino acids are made by your body, but under certain conditions their levels aren’t sufficient and you need to get additional amounts from your diet in order to meet your requirements. These conditions can include illness, intensive exercise or young age. The amino acids in this group include Arginine, Cysteine, Glutamine, Glycine, Proline, Serine and Tyrosine. Certain amino acids act as messengers in your nervous system, while others form a part of your haemoglobin and DNA. Amino acids have a large variety of functions. Vegans and vegetarians can lack some essential amino acids as they exclude animal products from their diets. There are however some plant foods that are richer in certain amino acids than others. These people need to include a variety of different plant foods to obtain the required amounts. Fats have been criticized harshly for weight gain and reversely also hailed as the wonder macro-nutrient for weight loss in the last 20 years. Who do we believe? Truth is, we all need fat as part of our diets. It is however quite high in calories: one gram of fat provides more than double the calories that one gram of protein or one gram of carbohydrates provide. The two main groups of fats include saturated fats and unsaturated fats. These descriptions are linked to their chemical structure. Because of their differences, they have different actions in our bodies; some helpful and some harmful. Saturated fats are mostly found in animal products – meats, chicken, dairy and eggs. Coconut (milk, flesh, oil), palm kernel and oil and Brazil nuts are the few plant foods that also contain saturated fats. Unsaturated fats are mostly found in plant products – most nuts and seeds and their oils and also olives and avocado’s. The only animal product that naturally contains unsaturated fats (omega 3) is fish and fish oil. A high intake of saturated fats increase a person’s risk to develop elevated blood cholesterol levels while unsaturated fats have a protective effect and raise healthy cholesterol levels and decrease unhealthy cholesterol levels. WHAT ARE MICRO-NUTRIENTS AND WHERE DO THEY FIT IN? Micro-nutrients are the smaller particles that ensure our cells function properly and that our immune system is strong enough. Micro-nutrients include vitamins (organic substances) and minerals (inorganic substances). 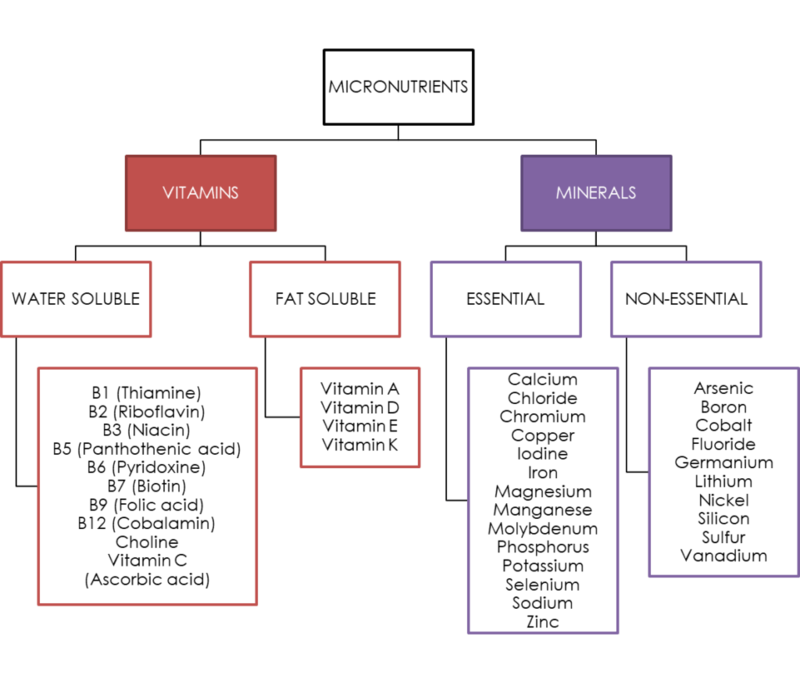 All vitamins are essential where minerals are grouped into essential and non-essential. A person can develop a deficiency of minerals and vitamins if they aren’t consumed in sufficient amounts or if the body uses a larger amount than what is consumed in the diet. Micro-nutrients exist in different macro-nutrients (carbohydrates, proteins and fats) in different amounts. Therefor it is important to have a varied diet and include all 3 food groups in order to ensure that you get all the micro-nutrients that your body needs. Micro-nutrients can be supplemented if necessary, but they are the most available and easiest to absorb from the food we consume. At your main meal, the portioning should ideally look similar to this picture. The majority of our meals should always be vegetable based and consist of either cooked vegetables, salads or both. This group contains a large variety of vitamins and minerals but are low in calories. This means that you fill your stomach with food that won’t cause weight gain. Neither the protein nor the starch portion should be too large as these contribute significantly more to your calorie intake. On the other hand, we still want to include them as they provide essential carbohydrates and proteins to our bodies that we need to sustain our basic bodily functions. WHAT DIET IS THE HEALTHIEST TO FOLLOW? A ‘diet’ refers to the complete combination of foods that we consume every day, although with the constant longing for weight loss solutions, this has become a concept that refers more to a weight loss program than the initial meaning. A healthy diet looks different to everyone. We are all individuals and therefor a solution that works for one person won’t necessarily work for someone else. 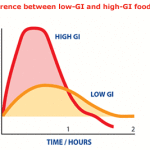 The Low GI diet: A diet plan structured around including a balanced amount of all macro-nutrients, but including low glycaemic index carbohydrate rich foods. The low fat diet: A diet plan where fat intake is limited to account for 30% of your total calorie intake, while ensuring that fat sources that are used include mostly unsaturated fats. The high protein diet: High protein diets focus on a higher than usual intake of protein rich foods and often restricting carbohydrate and/or fat intake. Popular high protein diet plans include the Dukan Diet and the Atkins Diet. The Banting diet/ LCHF diet: This diet stresses the intake of large amounts of fat and keeping to a very low carbohydrate intake (low carbohydrate, high fat). A healthy diet entails that a person is protected from all forms of malnutrition including noncommunicable diseases (NCDs) such as heart disease, stroke, diabetes and cancer. The calorie intake through food must be in balance with the energy used in physical activity. Total fat intake should be close to (ideally not exceed) 30% of the total calorie intake and should primarily be consumed through unsaturated (healthy, plant based) fats. Free sugar intake should be limited to 10% of the total daily energy intake and further health benefits are reached when limiting this intake to less than 5%. Salt intake should be limited to less than 5 grams daily to help reduce hypertension and heart disease and stroke risk in the adult population worldwide. A healthy diet should include a variety of vegetables, fruit, legumes, whole grain starches and nuts. Fruit and vegetable intake should be at least 5 portions in total on a daily basis. Enjoy a variety of foods daily to ensure the intake of a variety of nutrients. Live an active lifestyle and aim to do 30 minutes of moderate exercise most days of the week. WHAT CAN HELP MY WEIGHT LOSS ALONG? Weight loss is induced when your metabolism speeds up and your energy intake (food intake) is less than your energy expenditure (activity/ exercise). Drinking clean safe water on a regular basis throughout the day and eating small regular meals, help to increase your energy levels and manage blood sugar levels better to lower your risk for too low blood sugar and a sluggish and drowsy feeling. Avoid overindulging on rich, high calorie meals and focus on filling your plate with lots of colourful vegetables. 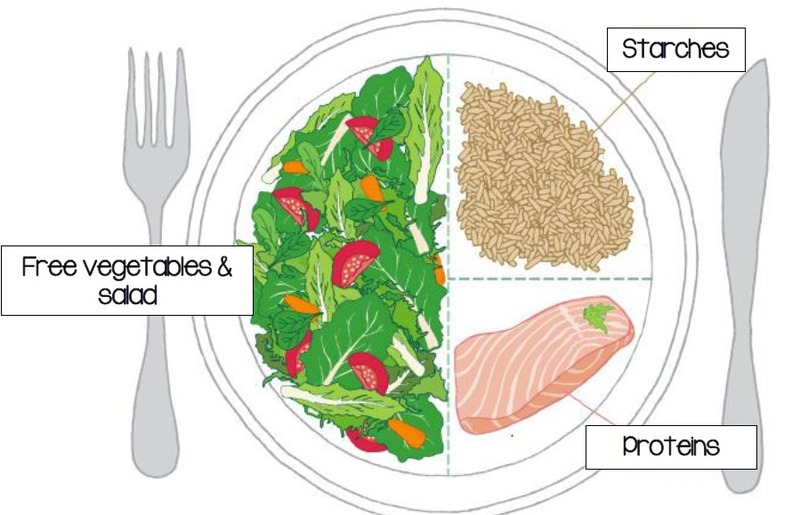 Manage your starch intake by having smaller portions and focus on having fibre rich alternatives. This makes you feel fuller and prevents hunger soon after your meal. Limit you sugar intake as sugar doesn’t add any nutritional quality (vitamins, minerals or fibre) to your meals. Limit alcohol use to 3 units per week for women and 6 units per week for men. Be as active as you can and build activities into your day when going about normal life, e.g. park your car further from the shops and force yourself to walk; carry groceries rather than pushing the trolley when you bought a smaller amount; take the stairs when possible. Visiting a registered dietitian is always recommended when you’d like to embark on an individualised diet plan and weight loss journey. He/ she will take your needs, medical history, family history, preferences, lifestyle, culture, religious beliefs and social circumstances into account when working out a plan that best suit your needs. Avoid ‘crash’ diets that omit food groups or require strict regimes. Make sure you have nutritious food in your fridge and cupboard – you’re going to eat what’s available to you. Nutrient Reviews. 2016. Amino acids. http://www.nutrientsreview.com/proteins/amino-acids. WHO. 2015. Healthy Diet. http://www.who.int/mediacentre/factsheets/fs394/en/. Updated September 2015. Food and Agriculture Organization of the United Nations. 2012. Food Based Dietary Guidelines. http://www.fao.org/nutrition/education/food-based-dietary-guidelines/regions/countries/south-africa/en/.